Police in Windsor, Halton and Niagara Falls will launch an educational campaign against synthetic marijuana this week. "We're going to work with businesses that are selling it and have it taken off the shelves," Windsor police Insp. John McQuire told CBC News. An official announcement will be made later this week, McQuire said. Herbal incense and synthetic pot, also known as K2, are sprayed with or made from a synthetic version of Tetrahydrocannabinol (THC), the active chemical in marijuana. The IZMS, a product sold in Windsor, lists natural and synthetic ingredients on its packaging, but doesn't say explicitly say what those ingredients are. Windsor police and Health Canada claim whatever the ingredients are, synthetic cannabinoids, or the element that creates the high, are illegal. "There may be many different synthetic cannabinoids," Health Canada spokesperson Sara Lauer wrote in an email, "but the phrase 'similar synthetic preparations' is only being applied to those which produce a pharmacological effect that is similar to that of THC, the principal psychoactive component of cannabis. "A compound is determined to be a "similar synthetic preparation" of cannabis if there is scientific evidence to show the compound produces a pharmacological effect that is similar to THC. Therefore the determination is not based on the chemical structure." According to Health Canada, symptoms associated with the use of products containing synthetic cannabinoids have been reported to include tachycardia, hypertension, chest pain, myoclonia, seizures, rhabdomyolysis, agitation, restlessness, hallucinations, acute psychosis, and vomiting. Long-term effects may include irritation of the respiratory passages (if smoked), cognitive changes and cognitive impairment, psychotic episodes, or schizophrenia in susceptible individuals. It is not known whether products containing synthetic cannabinoids are addictive. Still, those who use these drugs frequently may develop tolerance and experience withdrawal symptoms similar to those observed with marijuana. Synthetic marijuana or "legal pot" as it's sometimes known, arrived in Windsor sometime within the last year. "It's very new to the city — at least it's new to the police service getting wind of it," McQuire said. "It fell under the radar." The IZMS is sold at some stores in Windsor. A 1.25 gram package sells for between $10 and $20 across Ontario. "Normally, we don't look at stores for selling illegal drugs," McQuire said. "The way it was being advertised, it raised some concerns with our investigators." The packages are brightly coloured and the drug is flavoured. It's not sold at Endless Heights Culture Shop in Windsor. The store, which claims it was sent several sample packages of The IZMS, won't sell anything that doesn't list its ingredients. "It's a very intense high. It will plaster you to your couch," Endless Heights employee Trisha Carrol said. The store is still in possession of the samples. Carrol said she would turn them over to police. The IZMS CEO Adam Wookey told CBC News his product is completely legal. "The claim that it’s legal is based on its ingredients. The active ingredients are synthetic cannabinoids that have no similar structure to THC. Because of that, they are not considered to be similar synthetic preparation and, therefore, not illegal," Wookey said. "The problem with basing laws on pharmacological effect is that it’s extremely dubious." Wookey said that based on pharmacological effect, coffee and cocaine would be "similar." "It would open the door to vitamins and things we use lose in everyday life. If you started regulating stimulants ... it would open the door for a range of stimulants to be illegal." McQuire said he isn't aware of any charges related to synthetic marijuana being laid in Windsor. "If anyone was charged, we would support them and defend the position in court," Wookey said. McQuire said the product "hasn't become very popular" in Windsor. But police want to be ahead of what they say could become a problem. 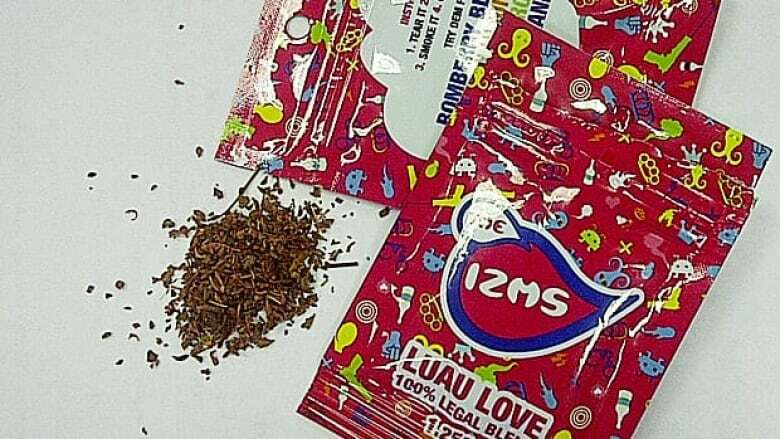 The State of Michigan in 2012 banned synthetic drugs such spice, K2 and bath salts. Neither McQuire or Carrol have encountered Americans coming to Canada for the product. CBC is taking steps to securely destroy the packages it purchased during this investigation.